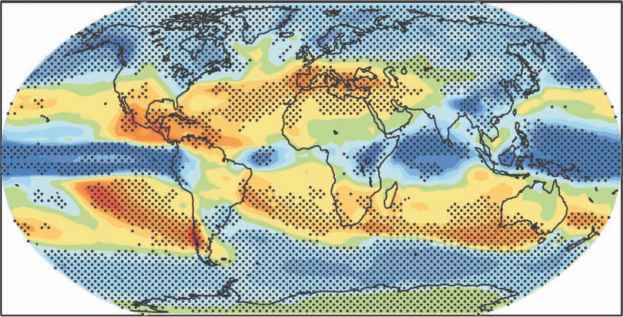 High temperature stress is relatively predictable in some regions (e.g. parts of South Asia and sub-Saharan Africa) increasing slowly in a way that permits plants to acclimate. In other regions, however, stress can occur quite suddenly and may be accompanied by desiccating winds (e.g. the Great Plains in the USA or North Africa). An additional dimension to heat stress is relative humidity (RH). In moist tropical regions, high RH further exacerbates heat stress in two ways. Saturated air: (i) reduces the potential for evaporative cooling of plant organs; and (ii) is accompanied by higher night temperatures. While optimum mean temperatures for different crop species are reasonably well defined, ranging from the mid-teens (degrees Celsius, °C) for wheat, to the twenties for rice, maize, sorghum and soybean (CCSP, 2009), air temperature is not necessarily an indicator of the stress experienced by plants. Specifically in low RH environments, plant temperature may be several degrees below ambient air temperature, assuming sufficient water is available to match evaporative demand (Amani et al., 1996). Therefore, the actual heat stress experienced by a plant will be a function not only of air temperature but also of agronomic and genetic factors determining the potential for evaporative cooling (Table 5.1).